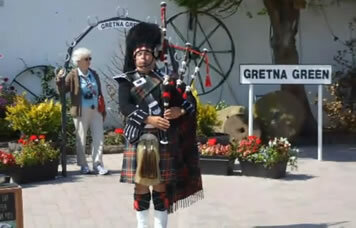 Kirkcroft Guest House is located between England and Scotland at Gretna Green. Public transport stops outside the house including buses to Moffat, Lockerbie and Carlisle. 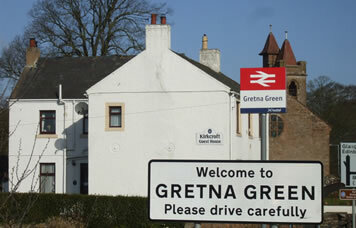 Situated just over the border with England, Gretna Green is well placed for touring. To the west of the Guest House is the lovely Galloway coast - travelling towards Stranraer with its Palm trees thanks to the Gulf Stream. Also to the West is the historic town of Dumfries with its links with Rabbie Burns. If these do not appeal there is the Scottish Borders with the town Hawick, home of the cashmere and knitwear industry. To the East of Gretna Green is Kielder Water and forest, the largest man made lake and forest in Western Europe. We also have Golf courses in Dumfries, Annan or Carlisle. Fishing on the Esk or Annan rivers. Shopping at the Gretna Gateway, Carlisle or Dumfries. Comfortable accommodation in a conevenient Gretna location from just £55 per night. Kirkcroft Guest House is a detached house built in1836 and was once used as the Post Office for Gretna Green and is now a comfortable and friendly Bed and Breakfast. Wedding Guests are very welcome! Kirkcroft Guest House is situated in the heart of Gretna Green - only 3 minutes walk from the railway station and across the road from Gretna Hall and 4 minutes walk from The World Famous Blacksmith Shop. © 2017, Kirkcroft Guest House. All rights reserved.